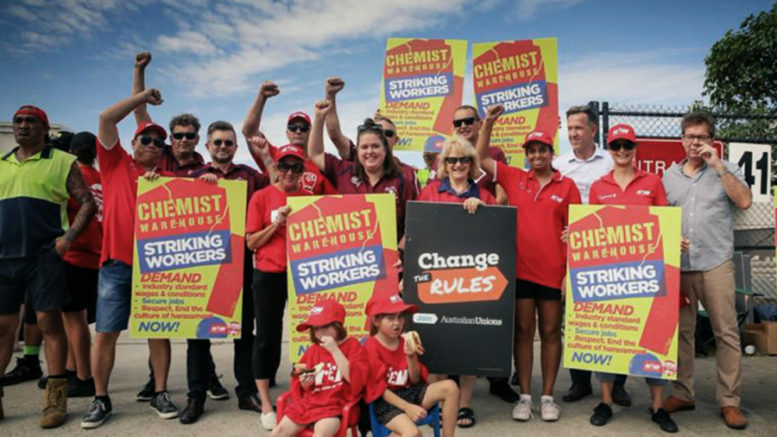 Chemist Warehouse distribution centre workers in Victoria and Queensland are campaigning to keep their jobs, to not have them transferred to a labour hire firm, and to put an end to poor conditions and wages that are well below the industry standard. They have been on strike since 12 March and are being supported by their union, the National Union of Workers (NUW). For too long Chemist Warehouse has been relying on low wages, labour hire, and a toxic work culture to make monster profits. The owners are worth over a billion dollars and yet they pay workers 25% below industry standards. We will not stop until all Chemist Warehouse workers have secured industry standard wages, secure jobs, and a safe workplace free from bullying and sexual harassment. Please sign and share our petition to show your support. 1 Comment on "Chemist warehouse workers call for respect from their employer"
If the lower prices are at the cost of the workers proper wages and wellbeing, I am happy to pay more as long as the money is really going to the workers. I heard from a union representative that the shop assistants are also badly treated.. Why oh why? Happy, decently paid and treated employees are an asset to any company. It only increaes productivity and that’s what it’s all about.